We are all exposed to thousands of toxins and chemicals each day at work, in the home, through the air we breathe and in our food and water. A recent well-publicized study found that the average Canadian has 53 chemicals stored in their bodies - a very troubling number. Our bodies are not able to eliminate all the different toxins and chemicals that we absorb. Toxins can accumulate in our cells, tissues, and organs, and remain stored for an indefinite length of time, causing a large number of health problems of varying severity. What are the effects of toxic overload? Skin: sweat is not a major way to remove toxins, though some toxins may come out here. Infrared sauna therapy may be useful. Lymphatic system: the most important detoxification organ, it removes waste from every cell in our body. Keeping lymph channels moving is required for a successful detoxification. 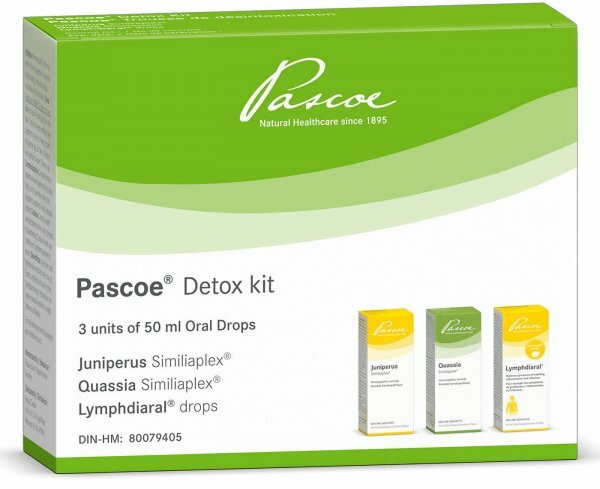 Pascoe Detox Kit includes Lymphdiaral, Quassia Similiaplex, Junipurius Similiaplex all in 50mL drops. The Kit is a homeopathic kit for the relief of sinus congestion, indigestion, hives, bloating, irritability, fatigue, headaches, and constipation. The products are made from plant-based naturally sourced medicinal ingredients that aid in the detoxification process. Pascoe's Detox Kit works to help eliminate unwanted toxins from the body. Use Basentabs pH Balance Pascoe (alkaline salt supplement) to aid in toxin elimination process. Support your body's overall health with Pascoe's Detox Kit - available over-the-counter. How do I use the Pascoe Detox Kit®? How long does the Pascoe Detox Kit® last? The complete protocol takes about 4-5 weeks. How often should I use the Pascoe Detox Kit®? As part of a regular detoxification protocol, most people detox once a year in fall or spring, or twice a year in both seasons. Put 30 drops of each remedy in a 1-1.5L bottle of water and sip slowly throughout the day. Do I need to change my lifestyle while on the Pascoe Detox Kit®? For best detoxification effects, you should reduce your intake of heavily processed foods, tobacco, alcohol, and other harmful substances. Keep a healthy acid-base balance by taking Basentabs pH-balance Pascoe (an antacid supplement from Pascoe. Learn more here). TIP: Those who cannot sip water all day long can take 10 drops of each remedy in a glass of water, three times a day. Pascoe Canada recommends the following basic guidelines while doing any type of detoxification. We do not recommend fasting, which can both overwhelm the body with toxins and cause it to be more run-down. Nor do we recommend radical changes in your diet. Rather, make smarter food choices. Eat a varied diet, high in fiber, high in organic fruits and vegetables, and low in animal protein and processed foods. Water: Drinking enough is key for detoxifying so that toxins can be eliminated. We recommend at least 2 liters of clean water a day throughout a detox program. Fibre: Make sure you get enough fibre, as fibre helps bind toxins which are removed by the liver and excreted into the intestinal tract, and keeps everything moving. If your bowels are not moving regularly, you should get that in order before doing a detox, or it will be more difficult for your body to eliminate the toxins. Supplement with a gentle fibre supplement if necessary. Antioxidants: Get enough antioxidants by eating a wide variety of fruits and vegetables. Some ideas include tomatoes (lycopene), citrus fruits (vitamin C), berries (anthocyanidins), and carrots (beta-carotene). Alkalinizing Foods: Removing excess acids from your body may be useful in helping to get rid of toxins. Avoiding excess animal proteins (especially processed meats) such as meat and cheese. Alkalinizing foods include all vegetables and most fruits, with some of the best being potatoes, celery, cauliflower, and bananas. If desired, you can add an alkalinizing supplement such as Basentabs pH-balance Pascoe®. Exercise: Mild to moderate exercise is great for promoting the movement of the lymphatic system, which helps bring toxins out of the tissues for detoxification. Exercise regularly, even a walk in the park or a short bicycle ride. Coffee: Not only is it a stressor and a net acidifying force in the body, there are a lot of different chemicals in coffee which must be detoxified. Smoking: Smoking clearly introduces a lot of toxins into the body, which does not help when you are trying to rid your body of toxins! Excess sugar: As a general rule most North Americans eat too much sugar and so it is useful to reduce our sugar intake not just while detoxifying, but in our everyday lives. Processed foods: Most processed foods have an overabundance of chemicals which the body must detoxify – so avoid them during your detox! Take Action: A detoxification program which encourages fasting, or eating only one type of food (such as a juice diet) adds stress to the body and often the digestive tract which is not good when you’re trying to eliminate toxins! Eat a varied diet and use a gentle but thorough detoxification such as PASCOE’s Detox Kit®. The Detox Kit product program supports all aspects of detoxification: the lymphatic system to transport toxins, the liver to detoxify them, and the kidneys and intestinal tract for elimination from the body. How to use Pascoe Detox Kit®? The Pascoe Detox Kit can be used as part of an annual detox program, or more frequently as directed by a healthcare practitioner. Supporting the lymphatic system, kidney and liver is crucial for a proper detoxification. Drinking sufficient water, increasing intake of vitamin-rich organic foods and exercise can all play an important role in supporting these organs and improving the body’s overall health. Take 10 drops of each product in water 3 times a day. product. Consult a healthcare practitioner before using if pregnant or breastfeeding. Consult a healthcare practitioner if symptoms persist or worsen. cause increased sensitivity to sunlight (Juniperus similiaplex). I just finished this cleanse and I have to say, I am very impressed. I was skeptical that mixing the contents from 3 little bottles in water and sipping throughout the day would do anything for me.... But, it really did. I noticed that I feel less lethargic and I have more energy, even my skin looks better as my husband said I have a slight glow! I feel better and that's the most important part. It says on the pack that you can do it twice a year, but I may do it once a quarter. Thank you Pascoe! I just finished this cleanse and it was easy and gentle. I have done other cleanses that were harsh and left me feeling depleted and exhausted. This one allowed me to go about my life as usual, but it still made me feel more energetic and rid me of toxins. I tried this cleanse after my friend got it for me, we did it together. I have to say I feel much more energetic and less lethargic. It's a bit of a commitment at 5 weeks, but totally worth it. And I love the water bottle it comes with! I really like the detox kit. It was very mild, I have my energy. We hope that you are enjoying our products! We always love to hear from our customers! As to your inquiry, please check the expiry date on the box, if it is still within the expiry date, it is okay to use. Starting second cleanse today, can't wait! First time was amazing.